I’m currently taking an online mindfulness course offered by mindfulschools.com, and in the material on a section about training for compassion, I found this story which I felt compelled to share. 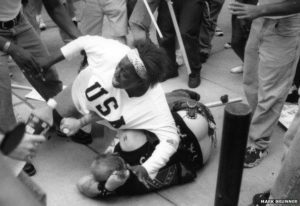 This iconic photograph was taken in Ann Arbor, Michigan, during a White Supremacist parade in 1996. Protestors had turned out in this progressive University town to send the message that the KKK were not welcome there. One of the SS tattooed marchers got on the wrong side of the fencing, and find himself surrounded by the anti-march protestors. He was chased and beaten to the ground. “Someone had to step out of the pack and say, ‘this isn’t right’… I knew what it was like to be hurt. The many times that that happened, I wish someone would have stood up for me… violence is violence – nobody deserves to be hurt, especially not for an idea,” explained Thomas, when asked why she did this. Compassion and empathy, as well as a not-small-amount of bravery, are essential tools and skills. I would argue that empowering children to be this way – especially through mindfulness training – is a vital step in turning the tide of hatred and violence. This is something we should be doing in schools. It’s probably more important than teaching Maths and Science (or any academic subject), to be honest.